The inscription on the first bottle is taken from Sanqingcha, a poem composed by the Qianlong Emperor on the merits of drinking his "three scents tea" (Sanqingcha), which were of plum blossoms, finger citron and pine nuts. "The color of prunus blossoms is not bewitching. The Buddha's hand citron is fragrant and clean. [I] cannot help laughing at Yuchuan's artfulness. To chant [a few verses] to my heart's content. It has been mentioned that the Qianlong Emperor was an avid drinker of tea, and in the 11th year of his reign (1746) on his return from visiting Mount Wutai, Shanxi province, his entourage sojourned to make tea using fallen snow. In the brew, as well as Longjing tea leaves, were the additions of prunus, pine nut kernels and finger citrus. It was this concoction that inspired the Emperor to compose the present poem. A range of Imperial porcelains, mostly teapots and tea-trays, were enameled with this subject during the Qianlong reign, but the poem continued in use on snuff bottles during the nineteenth century. 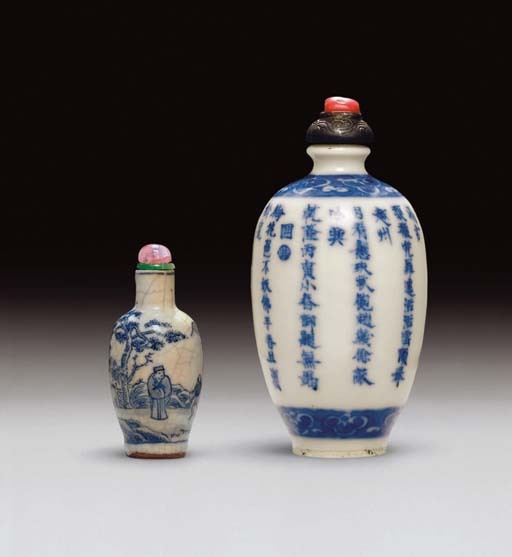 See a similar bottle, also with formalized lingzhi reserved on a blue ground, illustrated by J. Ford, Chinese Snuff Bottles. The Edward Choate O'Dell Collection, no. 170. Another is illustrated in The Au Hang Collection of Chinese Snuff Bottles, p. 198, no. 269.